Alex Rodriguez is interviewed by ESPN's Peter Gammons on Monday, Feb. 9, 2009. 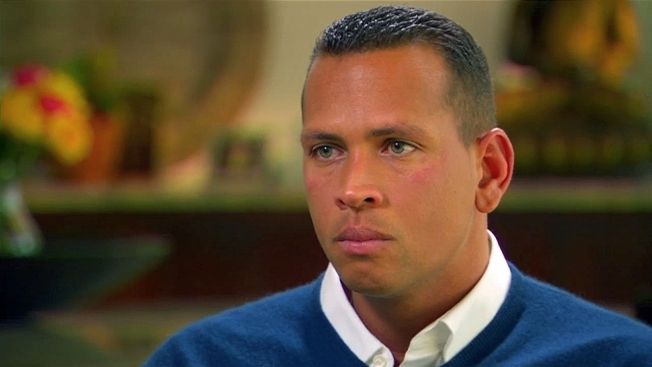 Alex Rodriguez confessed to using performance-enhancing drugs in an exclusive interview with Peter Gammons of ESPN. He said he was "stupid" for doing it and that he hadn't used since 2003. "I'm very sorry and deeply regretful," he said, apologizing to his fans and family. Rodriguez told Gammons that he wanted justify the 10-year, $252 million contract given to him by the Texas Rangers heading into the 2001 season. "When I arrived in Texas in 2001, I felt an enormous among of pressure. I felt like I had all the weight of the world on top of me and I needed to perform, and perform at a high level every day," said Rodriguez. Meanwhile, in his first prime-time news conference, President Barack Obama called Rodriguez's admission "depressing" news. "And if you're a fan of Major League Baseball, I think it tarnishes an entire era, to some degree," Obama said. "And it's unfortunate, because I think there were a lot of ballplayers who played it straight." Before heading to Texas, Rodriguez claims he had never felt tempted to use PEDs, claiming that he only used them from 2001 to 2003, or there abouts. When asked about what drugs exactly he used, Rodriguez said he was unsure, saying it was such a "loosey-goosey era," claiming he didn't "know exactly what substance" he used. "I'm guilty of being negligent, naïve, not asking all the right questions," he said. "To be quite honest, I don't know exactly what substances I was guilty of using." Rodriguez said he has been tight-lipped around teammates about taking steroids and equivocated on where he got the drugs. He also said he "experimented with things" but didn't get specific on what drugs he took. A-Rod described the drug-taking behavior felt to him like a "monkey on your back" and that he was glad to finally come clean about the "selfish" and "stupid" decision to use. "It's the biggest regret I have in my life because baseball has given me everything, and I have so much respect" he said. Rodriguez said he had a wake-up call during Spring Training in Arizona in 2003 when he realized he needed to stop using steroids. "I do remember thinking in my bed in Arizona, 'What am I doing? Wake up. Stop being selfish,'" he said. "You get to a point wehre you get tired of being stupid and selfish and not being honest with yourself." Rodriguez described his career as "prior Texas" and "post-Texas" in terms of steroid usage, claiming that for only three years he abused illegal substances. He also denied allegations in Jose Canseco's books that he was buddies with a steroid provider out of Miami. "That couldn't be more false. That's a hundred percent not true," he said. The slugger also said he was lying not only to Katie Couric during a Dec. 2007 interview in which he denied taking drugs but also to himself. "I wasn't even being truthful with myself," he said. A-Rod said he didn't know that he had tested positive for steroids until he was approached in his gym by a Sports Illustrated reporter before the steroid scandal broke. Rodriguez also fielded questions on former skipper Joe Torre's new book, in which the ex-Yankee manager alleges that teammates called the slugger "A-Fraud." "I don't have any problems with Joe," he said. "In our clubhouse everybody makes fun of me ... I like having fun. To me, there's no harm, no foul there." As for his future in Yankees, A-Rod said he spokes with the Yankees front office and they supported his decision to come clean. Rodriguez said that he never used drugs while in pinstripes and hoped fans would be willing to accept he made a mistake. "I'm going to be part of that team and do my best," he said. He added, "New Yorkers like honesty, they like people who say the truth." Rodriguez had gone rushing back to the comforting arms of superagent Scott Boras for advice following the initial allegations that he tested positive for steroids in 2003. "I spoke with him [Saturday] night and will speak to him [Sunday night]," Boras told the New York Post. This revelation, coupled with Torre's book which paints A-Rod as hopelessly vain and insecure, officially makes this the worst off-season of Rodriguez's career. When the press first contacted him about the rumors, Rodriguez said he would leave it to his union to handle it. But with A-Rod back from a quick jaunt to the Bahamas, that approach wasn't going to cut it. "If he tries to fight this, he is done," said former Yankee third-base coach Larry Bowa, now with the LA Dodgers, who was once close to Rodriguez. A full confession, as painful as it may be, was his best option. Three other big name Yankees have been tainted by the steroids witch hunt, each taking different approaches. Giambi offered a full mea culpa in May 2007, Andy Pettitte tried to excuse his use by saying he only did it to come back from an injury and Roger Clemens has flat out denied using any performance enhancing drugs, despite mountains of evidence to the contrary. Only Clemens remains a pariah. Teammate Derek Jeter, whos never passed up a chance to watch the bus roll over A-Rod, offered a mild defense. "My initial reaction is, let him respond," said Jeter, reports the New York Post. "Give him the respect to respond to it before you pass judgment ... Yeah, of course, everybody was shocked by it. You've got to find out both sides of the story before you make any assessment." Yankee GM Brian Cashman is no doubt ruing the day he signed the slugger to a 10-year, $270 million contract before the 2008 season. Now some are calling for him to release A-Rod. "Cut him loose – no matter the cost," wrote Bill Madden of the New York Daily News. While the Yankees could easily absorb the financial hit, whether they could weather the effects on the field – and by extension the turnstiles – is another story. It's been nine long years since the Bombers' last championship and the team desperately wants to open their new stadium with a bang. While some howl with glee or outrage about A-Rod's alleged steroid use, others wonder who are the other 103 men on the list. "I'd be all for the 104 positives being named, and the game moving on if that is at all possible," wrote Curt Schilling on his blog 38 Pitches. "In my opinion, if you don't do that, then the other 600-700 players are going to be guilty by association, forever." A-Rod parted with ways with Boras, who had counseled the All-Star since he was an 18-year-old phenom, following botched negotiations in 2007 with the Yankees. The pair tried to highjack the broadcast of the Boston Red Sox' World Series sweep by announcing during the eighth inning of Game 4 that they were done talking with the Yankees. Rodriguez ended up with a deal that was said to be about the same as the Yankees last one the team had offered Boras.